Bob Dylan and the Grateful Dead are artists who made their marks on American culture in the 1960s, a time often associated with far-reaching social and artistic upheaval. Indeed, both the Dead and Dylan owe a lot to the associations we attribute to that period - and no doubt how we view and judge those times owes to the work, styles and impact of these artists and others like them. You heard Dylan deliver a song like "Desolation Row," with its startling mix of vision and humor, despair and resolve, or you marveled at the Dead as they careened through "St. Stephen" - crisscrossing through a wondrous maze of time signatures, moods, improvisations and dreamlike affirmations - and you felt you were witnessing a new world being born, of endless and emboldening possibilities. And, of course, that is true: these were young artists in the heat of their own inventions, and in the heat of heady times. But the Dead and Dylan shared more than an impetus for innovations for its own sake. They also shared something deeper, something ultimately more surprising, complex, and enduring: a love for the ancient and mysterious qualities of the music that originally inspired them - music rooted in folk, country and blues traditions, even if their own music seemingly transmogrified those traditions. In a conversation I had with Dylan for Rolling Stone in 2001, he remarked: "Folk music is where it all starts and in many ways ends. If you don't have that foundation, or if you're not knowledgeable about it and you don't know how to control that and you don't feel historically tied to it, then what you're doing is not going to be as strong as it could be. That was what I was most interested in." Years earlier, in another discussion with the Dead's Jery Garcia for Rolling Stone about Workingman's Dead and American Beauty - albums that took a hard appraisal of the costs of psychedelic modernization - Garcia had told me that the band turned back to its earlier roots at that moment as a way of responding to the accumulated chaos that they saw swarming in their world. "It was our attempt to say that we can play this kind of music - we can play music that's heartland music. It's something we do as well as we do anything." With this sort of background - with a respect for the debts and meanings that come from tradition and an eye for recasting that tradition in new terms - it is hardly an accident that Dylan and the Dead have shared some significant common subject matter in their music. The songs they have written, as well as the songs they have chosen to cover, have often favored themes of mortality - reflected in a passion and weariness regarding life, and a fear but also a certain respect for death - and their music (its melodies and structures, its language and tales) has frequently depicted competing desires for order in the face of pandemonium, and for disruption over unearned stability. For me, these are the concerns that prevail in the Dylan songs that the Grateful Dead have performed here. By and large, they were composed during Dylan's mid- and late-1960s fervor period, when he was writing in the quicksilver of odd hours, delivering us all to unfamiliar and transfixing understanding of the world and time we once thought we knew so well. The characters in songs like "Stuck Inside of Mobile with the Memphis Blues Again," "Desolation Row" and "Just Like Tom Thumb's Blues" were caught in states of bewilderment. They were moving fast through mystifying settings, and they were scurrying from the debts of the past - from the history that had shaped them, from memories that impelled them to flee but never quite escape - moving toward exciting yet uncertain fates. By the time the songs are over, we don't know if the people in the songs (and therefore ourselves) have won a hard new freedom or if their adventure has cost them everything. All you know for sure is that after experiences and music like this, nothing can ever be the same. And yet in "When I Paint My Masterpiece" and "All Along the Watchtower" we hear a different voice: a voice that doesn't always trust the misapprehensions of adventure and revolution. "Let us not talk falsely now/The hour is getting late" may be one of the most urgent and defining couplets in all of Dylan's writing. Certainly, Bob Weir sings it that way here, and Jerry Garcia backs it up with a guitar line that fastens the song's truth to the ages. In the end, we need all these songs, all these characters and their voices - the cocky ones, the honorable ones, the devastated and the emancipated - for the full picture of the journey that this music envisions. The songs and their songwriter, as well as these musicians and their music, take us through hope, disillusion, loss and rejuvenation. By the time we've witnessed all this, we feel we've heard something that helps us withstand anything the world might throw at us. And so, these are songs about possibility and fate, as Bob Dylan first imagined these prospects in the 1960s, and as the Grateful Dead continued to search through and elaborate on them in live performances from the 1980s and early 1990s. But this is also an album about language - about how people relate to each other not just through words, but through music. The Dead were drawn to these songs not only because they recognized their own outlook in Dylan's lyrical sensibility, but also because they knew they could find something valuable about themselves and their own music in Dylan's compositions. Consider, for example, how Jerry Garcia's guitar commentary - his rich, almost visual lines in "When I Paint My Masterpiece," his multifaceted and rhapsodic fills in "Stuck Inside of Mobile" and "Just Like Tom Thumb's Blues" - adds as much to the meaning in the song's moment as do Dylan's words. Garcia was a guitarist of boundless imagination and enormous power, and in several instances here it's as if he were Dylan's belated collaborator, finding new, unspoken depths behind the songwriter's intentions - for example, the way staggeringly dense and mementous solos on "All Along the Watchtower" propel the lyric's sense of urgent destiny, as if everything about the song and its performance was delivering us to some place inevitable and irrevocable. Also there's Garcia's own forlorn singing on "She Belongs to Me" - as good as I've ever heard from this affecting yet largely underrated vocalist. Speaking about Garcia's singing, his songwriting partner, Robert Hunter, once told me: "When the pathos is there, I've always thought Jerry is the best. The man can get inside some of those lines and turn them inside out, and he makes those songs entirely his. There is no emotion more appealing than the bittersweet when it's truly, truly spoken" - and it is truly, truly spoken here in "She Belongs to Me," as well as Garcia ever realized it. 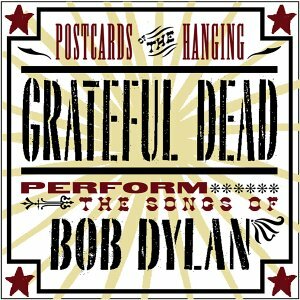 Beyong that, Postcards of the Hanging is - like all of the music made in the Grateful Dead's history - also about musical language as a form of communion - as a way of getting through life, and as a bond between partners that can prove as thick, intricate and sustaining as the ties of blood. To see the Grateful Dead onstage was to see a band that clearly understood the meaning of playing together from the perspective of the long haul. Interestingly, that's something we've seen fairly little of in rock 'n' roll, since rock is an art form whose most valuable and essential pleasures - including inspiration, meaning and fraternity - are founded in the knowledge that such moments cannot hold forever. The Grateful Dead, like any great rock 'n' roll band, lived up to that ideal, but they also shatttered it, or at least bent it to their own purposes. At their best, they were a band capable of surprising both themselves and their audience, while at the same time playing as if they had spent their whole lives learning to make music as a way of talking to one another, and as if music were the language of their fellowship, and therefore their history. No doubt it was. What the Grateful Dead understood - probably better than any other band in pop music history - was that nobody in the group could succeed as well, or mean as much, outside the context of the entire group, and that the group itself could not succeed without its individuals. It was a band that needed all its members playing and thinking together to keep things inspiring. It is interesting, of course, that when the Grateful Dead and Bob Dylan later teamed up to play as a performing unit in a late 1980's tour, the pairing of these similar-minded but irrevocably idiosyncratic wonders didn't always work as fluently as one might have wished for. Dylan was - and remains - an artist reluctant to be contained or delimited by anybody's expectations - he's a man who even with bands beside him through the years, has pretty much stood on his own. For all the Dead's adaptability and ingenuity, they couldnt' always follow his caprices and instincts, though they tried. Still, Dylan and the Dead's collaboration made for enough remarkable musical moments - more than are readily apparent on the official 1989 Dylan and the Dead album release. Also, Dylan later admitted that the experience of playing in the Dead's company was a turning point in his musical life - an event that helped him find new faith in his music. "It happened... when I was playing some shows with the Grateful Dead." he told Rolling Stone in 2001. "They wanted to play some of my songs that I hadn't played in years and years... I really didn't think I had a mind to do them, but when I began to play with the Grateful Dead... I really had some sort of epiphany then on how to do those songs again, using certain techniques that I had never thought about... I was kind of standing on a different foundation at that point and realized: I could do this. I found out I could do it effortlessly - that I could sing night after night after night and never get tired. I could project it out differently." In the end, Dylan and the Dead's greatest cooperation occurred in how they inspired one another over the years - in how they informed each other of new promises still to be uncovered by exploring older music, and plumbing it for new mystery and sustenance. As intriguing as Postcards of the Hanging is, it is hardly the final word on the rich associations between these artists. There are other luminous examples of the Dead's performance of Dylan songs - some reaching back into the 1960s - that may eventually be collected, and there are also the recordings of the 1987 Dylan-Dead rehearsal sessions in San Rafael that have appeared here and there in bootleg form, and that hopefully will be harvested someday for a fascinating release. And then there are Dylan's own live covers of such songs by the Dead as "Friend of the Devil" and "Alabama Getaway," among others that proved among his most stirring live performances in the1990s. Across time, and despite age, change, loss, and even death, the Grateful Dead and Bob Dylan still have much to say to one another, and the interlocking shadows in their histories still have rich depths to give up. We're lucky to be witness as some of their hidden dialogue is revealed in this collection, and hopefully in others to come. This sort of project works best when many ears are applied. Bob Weir supported this project from its inception, listened to many possible tracks, and made some important critical decisions. When I started considering material for this collection, I consulted with friends and fellow Deadheads on the phone and in a number of online forums, and I also relied hugely on the great taste and deep knowledge of archivist David Lemieux. This album was released in 2002.